Description: This lovely lace scarf surely will make you feel beautiful and elegant. It would be a fabulous gift for someone special to you as well. The scarf can be worn in so many different ways such as a shoulder wrap, a head scarf or just simply hang it around your neck. 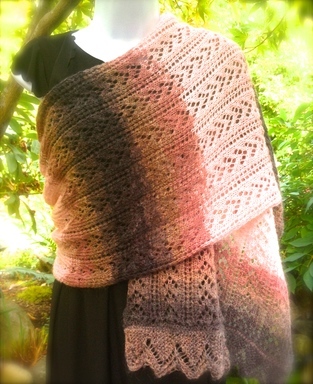 The whole scarf is knitted with a little less than 2 balls of lace weigh yarn (less than 6 oz). 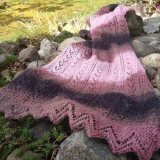 The lace pattern is beautiful enough for experienced knitter and yet easy enough for new knitters to learn. 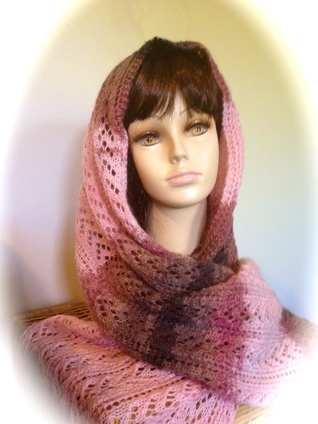 The edging video tutorials are available to view if you ever needed help with the pattern. The body lace pattern has only 6 repeated rows. Once you get used to the pattern, you’ll automatically knit without every looking at the pattern. The edging is done separately and then stitch to each ends of the scarf. Measurement: Measured after the scarf has been blocked. Length = 71 inches, Width = 17 inches. 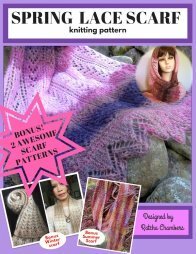 - 2 balls of lace weight yarn (yarn category 2). Each ball has 85g/3oz and 498 yards/455 meters of yarn. I used Patons Lace in woodrose color.